Specializing in the safe and humane removal and control of all nuisance Wildlife. We are Licensed by the New York State Department of Enviromental Conservation, and fully insured. No, Cayuga Creek Nuisance Wildlife Removal is a private business specializing in wildlife removal and control. We are not funded by any state or local govt. Fees can vary. Most of the time we can give a quote over the phone. Can't I just trap my own animals? Yes, although you can trap on your property, it is illegal in NYS for anyone unlicensed to transport wildlife in NYS. Anything captured on your property would also have to be released on your property. I was trapping rabbits out of my garden and caught a skunk, will you come get it? Yes, this is a common call. We will charge a service fee, and will return your cage within 72 hours. I saw a raccoon in my yard during the day, it must be rabid right? No, it could just be hungry. Always side on the side of safety, never approach any wild animal. Give it some time and it will probably leave on its own. If it stays give us a call. How often do you check traps? 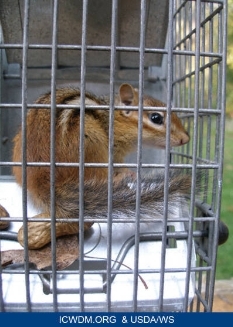 The homeowner or tenent is responsible for checking traps daily. Any catches wild or domestic should be reported to us immediately. We will then be out to pick them up. What kind of traps do you use? We have a large varity of traps at our disposal. We always attempt to capture the animal alive, although it is not always possible. All methods are discussed with homeowner prior to use. Do you capture or pick up dogs and cats? No, we are not licensed to deal with domestic animals. Please call your local animal shelter for direction. Do you use chemicals or pesticides. No, we do not use any chemicals or pesticides in our services. We are not a pest control company, and deal exclusively with wildlife.